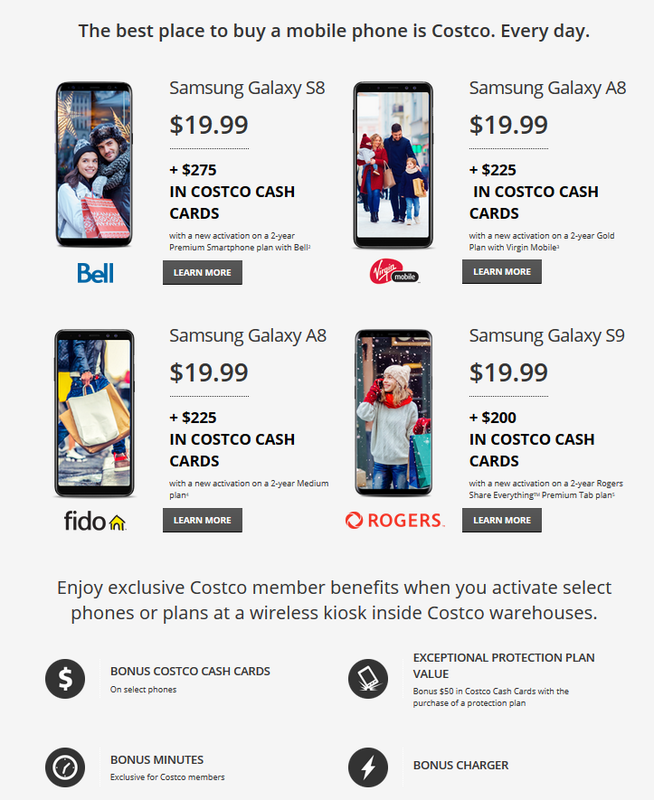 Costco Canada Black Friday Phone Deals! Black Friday is almost here! Each year Costco Canada offers up great deals on electronics, movies and clothing. Costco Canada has not released their Black Friday Flyer, but there has been one for the past couple years. You can check out 2017 flyer here, 2016 flyer here, and 2015 flyer here. You may get a taste for what will be on sale this year. As soon as I get a copy of the flyer I will post it. Yes, they were really easy to deal with! We had our phones through Telus and we were paying out of our ears, I’ve quick visit to the Costco cell phone booth we were connected to virgin and are paying less than half of what we were before for even more service! Highly recommend going through Costco. I just want to say thank you again and to your brother for helping you out! Your emails and efforts are extremely helpful not only with grocery savings but gas too since I only go when deals are on for items I regularly buy. Highly recommend avoiding Costco wireless kiosk. The reps working the booth are paid on commission and are looking to make as many sales as fast as possible. They will say anything to make a sale and will upsell as much as possible. Savings comes in the form of the Costco cash cards. The actual monthly rates are through the provider and the best deals can be negotiated directly with your wireless provider. I would recommend going to them if you have done your due diligence beforehand and know exactly what you want to take advantage of the cash cards. However, you’d still be giving these clowns a commission they don’t deserve. Wrong! They don’t get commission! That is false. They do make commission at the wireless kiosk. Every phone they sell, they make a commission off you. That is why the upsell and push you through as quick as possible. I explicitly asked the staff as well as the regional manager and they did indeed confirm they make a commission off of every sale. In fact the guy said to me you made this so easy for me I should be paying you the commission. I’ve gotten 3 phones from the kiosk, 2 for myself and one for my hubby over the years. I’ve always been happy with the service and between extra time and or dsta have always come out happy and saving money. Any chance someone could post the price on buying out a phone without a contract? My wife has a great plan already with bell and just needs a phone. Probably the s8 or s9. That is a false claim. The Costco Wireless Kiosk staff make a commission off every phone they sell. That is why they push you through fast and try and up sell. I spoke to the employees and regional manager of the Wireless Kiosk and they did indeed confirm they make a commission of every phone sale. In fact, the guy I bought a phone from said you made this so easy for me I should be paying you the commission. We had the best experience with the Costco phone kiosk. This was 2-3 years ago…we have a very simple emergency plan, which we were able to keep.We needed a newer phone so we could use the Bluetooth in our car…we thought we needed an iPhone so we would paying out more money than we wanted. The fellow asked how we used the phone for and we just need it for emergency or quick calls. No data needed for us….and he made sure that is was disabled so I was not using data by mistake. He suggested a Samsung Galaxy Core, I think….it is. He even programmed the info contacts from our old phone and came out to our car to make sure the phone was hooked up to the car correctly and it worked. I did tell him how much we appreciated not getting unsold to something we really did not need. He said he was actually the manager and did not believe in talking people into something they do not need. So our experience has been fantastic with the Kiosk at Costco. Regardless of what John thinks (commission/no commission) I really don’t care. I’ve always had great experiences getting phones at the Costco Kiosk. They don’t pressure you to go with a particular plan (at least didn’t with me) and I got a great deal on phones and plans (I deal with Fido) I’ve finally convinced my hubby to do the same. I just want to be clear that I do sincerely like Costco Wholesale. However, “Wireless Etc” is NOT Costco. Wireless Etc is owned by Glentel Inc and are the #1 Cellular Retailer in Canada. They are also required to sell their extended warranty at over 40% success rate per month. Two months under and you are out . My advice is to please always do your research before buying a phone anywhere.